The Scottish Court of Session papers are brimming with stories and descriptions of life in all its variants in seventeenth and eighteenth century Scotland. They contain a breadth of cases, dealing with seemingly mundane matters of legal dispute, such as matters of possession or the rights to ownership over land, ships, inheritance or the patent to sell cow hide. 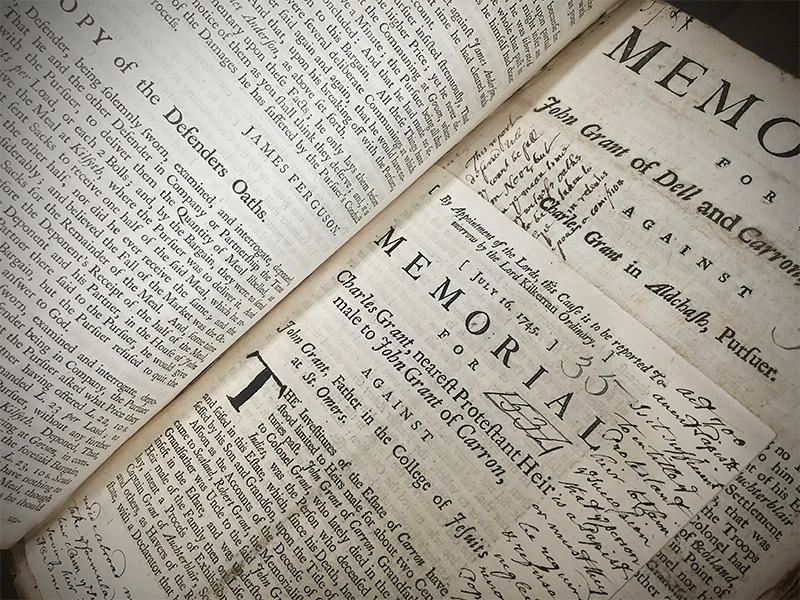 During the process of legal scrutiny, document by document a story gradually unfurls, painting an often vivid picture of life in the particular societal historical context of Scotland at this time. In the midst of one of the many volumes from the Signet Library collection, dated 1858, is a case which couldn’t help grabbing my attention. It contains, as minutely indexed in the first pages, a collection of love letters penned by a Reverend Cathcart Leslie to Mrs Catherine Mitchel or Leslie. They were included in the court documents as Catherine attempted to prove the legitimacy of her marriage in lieu of her husband’s death and a competing heir at law, one James Milne Leslie, Wine-Merchant in Philadelphia. Cond. 5. In the end of the year 1827, and after the pursuer and Mr. Leslie had been betrothed and engaged to each other for about five years, they deemed it proper and expedient formally to accept each other as husband and wife, although the said Cathcart Leslie, being desirous to keep the marriage secret, principally in consequence of the inadequacy of his means to support the married state in a way befitting a clergyman, requested the pursuer to dispense with a public marriage to which she reluctantly consented. Cond. 9. In or about June or July 1846, the said Cathcart Leslie was presented to the church and parish of Borthwick and went to reside in the manse of Borthwick until shortly before his death. The pursuer naturally thought that when thus settled in life he would acknowledge her publicly as his wife; but having got very early in life into great pecuniary embarrassments he delayed doing so, and they continued to prevent him doing so ever afterwards, notwithstanding her repeated solicitations to be so acknowledged. The remainder of the case documents provide evidence from various witnesses. Some were acting for the pursuer and attempting to prove the couple were indeed in a married state, and thus that the widow should be legally entitled to an endowment. Some were acting for the defence, and roundly denied the marriage ever took place or that any legitimate relationship existed. Buried deep in the case are a series of letters sent between Cathcart and Catherine Leslie containing declarations of love and speaking of the tensions of being apart and secret. What emerges is the story of a relationship lived out in the shadows, hidden from the accepted mores of the time, which sadly ended in what some believed was suicide. It provides a fascinating insight into the relationship between these two unknown figures and one woman’s fight to legitimise her relationship and claim what she believed was her rightful entitlement. This printed documentation is often overlaid with handwritten annotations in response to the cases which add to their intrinsic value. The task of physically scanning these valuable volumes is what I have undertaken during my seven weeks as part of this project. Some are wee slivers containing only a few short documents, whilst others are monolithic wedges of crumbly leather that span thousands of pages of text. As I work my way through, the rhythm of scanning takes over, and my attention is given entirely to the quality and sharpness of the image over the meaning of the words. However, occasionally something else catches my eye and makes me pause for a moment. In amongst the dense legal language of the text block an instance of intrigue is offered by two sketches discovered during the scanning process. A moment of wandering concentration during a long meeting or seminar is something I think we can all relate to and, as these doodles attest, the owners of these volumes were no different. 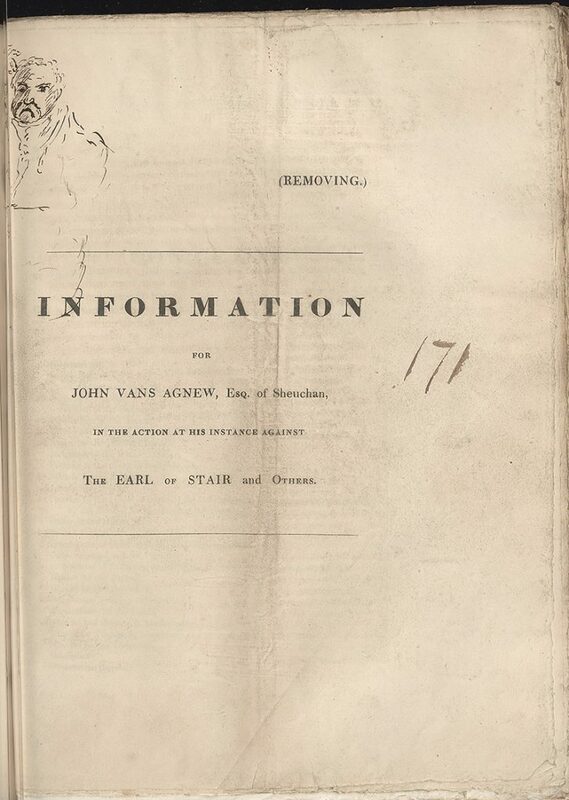 In this first image, the outline of a morose looking man appears from the edge of the page, preceding a report of a land dispute between John Vans Agnew and the Earl of Stair. 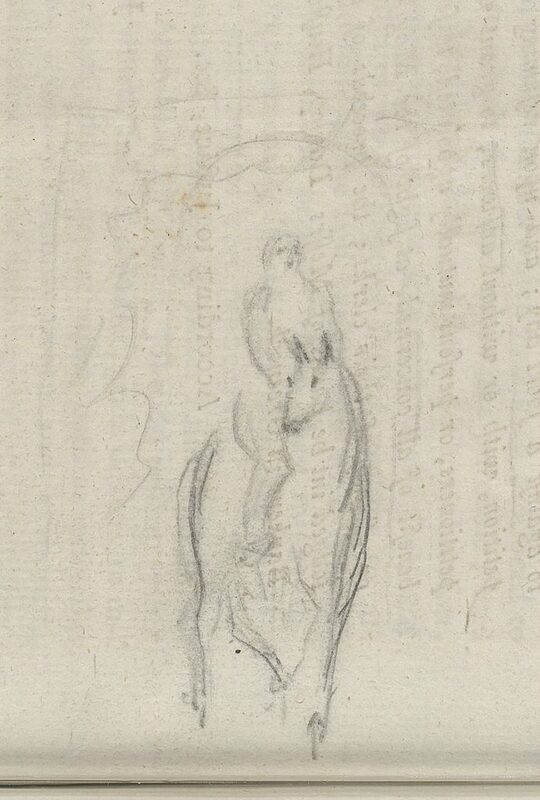 Meanwhile, the second image depicts the shadowy sketch of a figure on a horse, filling the blank page before the report of a clash between David Armstrong of Kirtletown and his creditors. It is hard to speculate who these unknown artists were, perhaps law students laboriously studying past cases, but regardless, their absentminded scribbles provide some interesting images. The digitisation of the Scottish Court of Session Papers goes some way in bringing to life the wealth of knowledge that they contain. These papers obviously provide an unseen wealth of research possibilities to a wide range of disciplines and audiences. Who knows what other gems we may discover in the form of absorbing cases or moments of artistry as we work our way through this project. The Courts have now stopped access to the Session Papers and the historical resource and record has run out (at least for now).